Multi-color poster shows a reproduction of Giorgio de Chirico's painting "Hector and Andromache," of two surrealist figures standing together. Text overlapping a red horizontal band across the bottom of the page reads, "Theater Forte Presents / Don Juan, or the Love of Geometry / A Comedy by Max Frisch/Directed by Mohammad Kowsar." 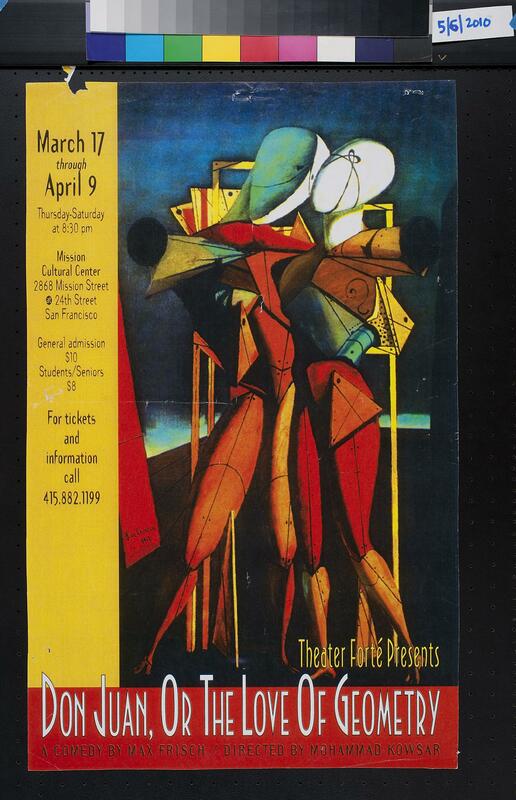 Dates of March 17 through April 9, the location of Mission Cultural Center in San Francisco, and ticket information is listed in a yellow vertical band on the left side of the page.